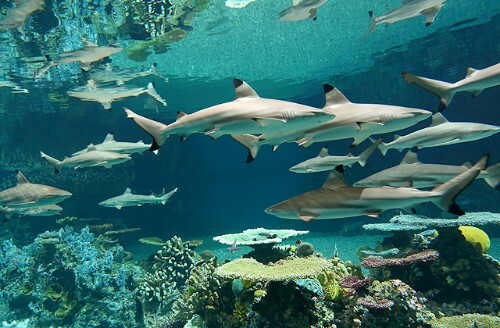 Sharks in an aquarium. Image source. Recently Hendrix and I went to an aquarium here in Shanghai. It was a weekend and the aquarium was so crowded, and there were tons of little kids being loud. The amount of crowdedness was just... hard to describe, like nothing in my suburban US childhood, but pretty normal for a big city like Shanghai. I was really really uncomfortable having so many people all around moving in unpredictable directions. Like, if no one is moving, or there's only one direction that people will be moving in, that's fine for me. But to have to constantly monitor 360 degrees all around me, to make sure nobody is touching me and I'm not blocking anyone's way, dang that's EXHAUSTING. And did I mention it was loud? You know all those glass walls at the aquarium- the sound bounces around and it's basically a constant dull roar of crowd noise. And I just want to look at fish and penguins and there's all these PEOPLE crowding around with their cell phone cameras and bumping and not having any concept of personal space. Anyway, I don't know if it's because I have autism or if everybody who grew up in the suburbs with limited experience in city crowds would be freaked out and uncomfortable in that environment. I asked Hendrix (who is Chinese) if he thinks the average Chinese person is okay with that- he said they are used to it but don't like it. So when we walked in to the aquarium, and there were so many people we couldn't even get close to the first fish tank, I brought Hendrix over to the (empty, non-crowded) wall and told him I felt really uncomfortable because of how crowded and loud it was, so I will probably need to take a lot of breaks. You know, like when I feel overwhelmed, go over to a quieter, hallway-type area with no fish tanks and therefore a reasonable amount of people (walking through in one predictable direction rather than crowding around). Yeah, like I can take a break and go stand by an empty wall for a little bit, until I feel better and ready to look at fish again. So this was my plan, and I let Hendrix know about it. I'm writing about it because this idea of "make a plan beforehand and communicate about my needs" is still so new and revolutionary to me. Ever since I was a little kid, if I was in an environment that wasn't comfortable for sensory reasons, I would just "pretend to be normal" and then if it got so bad I couldn't pretend anymore, I would "suddenly freak out." I don't know when that habit started, but maybe it was because adults didn't take me seriously if I did say that I had a hard time being in certain environments. They said it's "not that bad" ... and I wanted to be a good kid and not "complain." I thought that the adults understood how nervous and uncomfortable I felt, and they had made the decision that it was fine and I just needed to "obey" and accept that. I would try to go along with it and be like everybody else, trusting that if the adults thought this environment was okay for me to be in, then it was. Trusting them more than I trusted my own feelings. (Notice this is similar to gaslighting- and probably everybody who's autistic or has sensory processing issues is SEVERELY gaslighted by other people for their entire life.) That's what it meant to be "brave", the adults told me- it means continuing to stay in a situation where you don't feel safe, and not complaining about it. So I would feel anxious, sometimes for hours, and keep trusting that no really it's okay, it's fine. Until I couldn't trust anymore. I couldn't ignore reality any more. There would be a moment where the stress was too great, and it would all come out, all the anger and pain at being forced to exist in this environment that constantly irritated my senses. An outside observer might say "everything was fine, and then you suddenly freaked out," but really it was after a long period of time where I could barely think about anything else besides withstanding the sensory inputs and trying as hard as I could to act "normal." And when I've expended all my energy on "acting normal" and I'm at the breaking point, I'm not able to tell people in a nice and polite way "this is bothering me so I will just leave for a little bit." Instead I'm angry at how people react like they're shocked and have no idea what the problem is. All this time, they've been existing here, in the same situation as me, somehow not noticing the constant sensory assault all around us. In that mindset, the idea of communicating beforehand "hey I feel kind of nervous here so at some point, if it gets worse, I'll have to take a break" is not okay at all. That would be admitting defeat right at the beginning! Not even making an attempt to "be normal." How can I ever learn to "be normal" and stop being so weak and pathetic if I give myself a way out like that? But now, just in the past few years, I've figured out that my needs are actually legitimately different from other people's. And those needs are real things and it's not "selfish" for me to advocate for myself. I've developed this new strategy where, if I'm experiencing something that could potentially become overwhelming and traumatic, I communicate about it to people who care about me, and make a plan about how to leave if necessary. And wow this works SO MUCH BETTER than just "try to be normal." I feel a lot safer knowing there's a plan in place if the sensory stimulus becomes unbearable, and knowing that people support me and care about me. Maybe this wasn't possible when I was a child. Maybe I didn't have enough freedom- the adults might have thought "we can't just let her avoid things if she doesn't like them- how will she learn to function in the real world?" and would not have let me use the "communicate about my needs and make a plan about how to leave if necessary" strategy. This is still so new to me, but it's so much better. And I'm glad I have a loving and supportive husband who believes that my needs are real needs.